While balancing her football commitments with Canberra United, Heyman works tirelessly to spread the message that it’s okay to be who you are. And to win an award for being herself, that’s one of the greatest things that could happen to the 28-year-old. 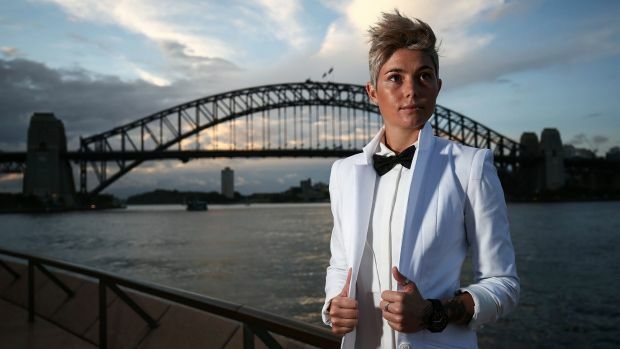 Heyman was crowned the sports personality of the year at the first Australian LGBTI awards at the Sydney Opera House on Thursday night. “The opening line that I said was just that it’s just amazing to get an award just for being myself,” Heyman said. The nerves were understandable – Heyman was in a field featuring Olympic diver Matthew Mitcham, cricketer Alex Blackwell, tennis star Casey Dellacqua, footballers Sam Gilbert and Jason Ball, and swimmer Daniel Kowalski. Heyman told herself not to get her hopes up, but as the announcement drew closer she was on the edge of her seat. It was uncharacteristic to say the least – Heyman is usually ice cool on the park, but this meant much more than a game. “I think it actually means a lot more, because my entire life I’ve always had my soccer and I’ve always been good at soccer,” Heyman said. The Canberra co-captain has committed to playing for the next four years with her eyes locked on another Olympic campaign, but during that time she will be “as loud as [she] can”. 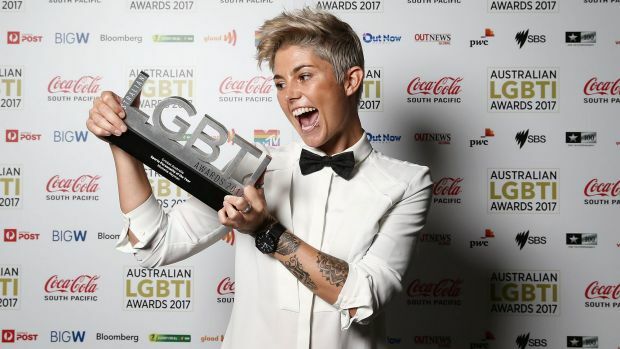 Heyman’s recognition comes as Football Federation Australia takes “a step in the right direction” in promoting inclusion in football for the LGBTI community by joining Pride in Sport as a foundation partner. A congratulatory email from FFA chief executive David Gallop with the announcement attached greeted Heyman on Friday morning. The FFA’s “amazing” move is designed to help the LGBTI community feel more comfortable in a sporting environment. “I’ve never had any issues personally with it, so for me it’s just very normal,” Heyman said. “But at the same time it’s getting very positive which is a nice feeling. I believe that what everyone’s doing within sport and being comfortable is just the right thing to do and it’s the right way to go. The only openly gay athlete to represent Australia at the Rio Olympics, Heyman is now preparing to jump on a rainbow Holden ute at the Mardi Gras parade for the first time.